The iOS App Store is a big place, offering over two million applications in total. However, there are actually some apps you can and should install on your iPhone that the iOS App Store doesn't include. 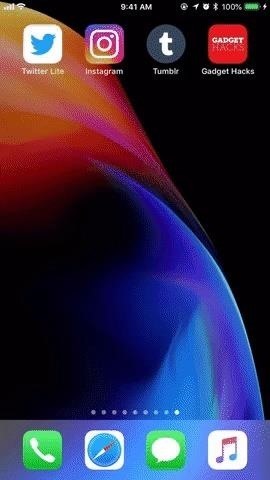 And no, these apps do not require any difficult jailbreaking or complicated sideloading techniques — they are really simple to install. The apps we're talking about are progressive web apps (PWAs, for short), apps that function just like traditional ones but that are developed and designed to run through the web. That means the apps are lighter, take up less storage space, and can even save on cellular data. Many even save pages for offline viewing automatically. And for anyone without an Apple ID, you're in luck — web apps are free to download without the need for a separate account. While Apple's attitude toward PWAs has been a bit blasé, the company appears to be changing its ways. With iOS 11.3, Apple has implemented greater support for web apps, which allow developers to take advantage of the lightness, speed, and low storage space that PWAs can offer. Another plus to using PWAs is that many are free without advertisements. That situation is not very common on the App Store, and while increased support for PWAs may change that, as it stands, you'll have an ad-free experience on your hands. With all of the advantages PWAs can offer, Firtman acknowledges there are still weaknesses compared to full applications. You can only keep up to 50 MB of offline data on each PWA, and, if not used for an extended period of time, PWAs will offload from your iPhone. The icon remains, however, so you can simply tap it to reinstall. PWAs do not have access to Bluetooth, serial, Beacons, Touch ID, Face ID, ARKit, altimeter sensor, and battery information. PWAs don't have access to execute code in the background, to private information, or to their corresponding applications. You also won't find in-app purchases, Siri support, or icon badges, which, depending on who you are, might be good news. PWAs on iOS also cannot currently save their state when you exit them. That means the app reset every time you leave and return. Just keep that in mind whenever you're using one — your activity cannot be saved, unfortunately. Although we're starting to see more support for PWAs on iOS, Android still has the advantage here. Android users have much of the features and controls above missing from iOS, such as higher storage limits, no automatic deletion, Bluetooth support, background sync, push notifications, and more. 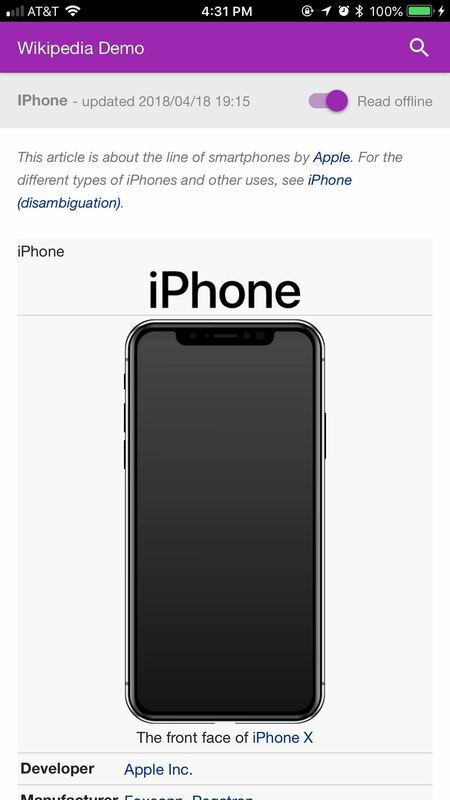 However, iOS has some advantages over Android — you can change your PWA's name when installing them (just like you can a webpage shortcut on your home screen), and PWAs can be placed in a configuration profile. While this list is far shorter than Android's, hopefully, it grows as Apple gives more control to developers. While they might sound a bit technical, PWAs are actually very easy to download and use. It follows the same process as saving a webpage to your home screen, however, instead of simply linking you to that webpage, PWAs turn that saved bookmark into its own application. 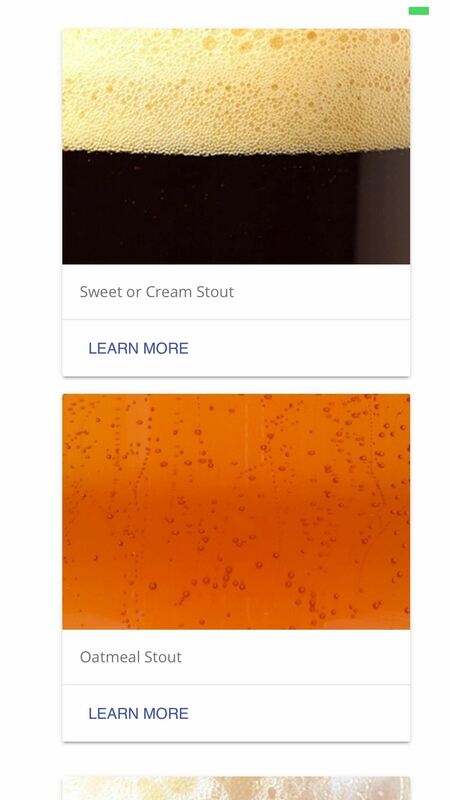 When on a PWA site, simply tap the share button in the bottom of the display. 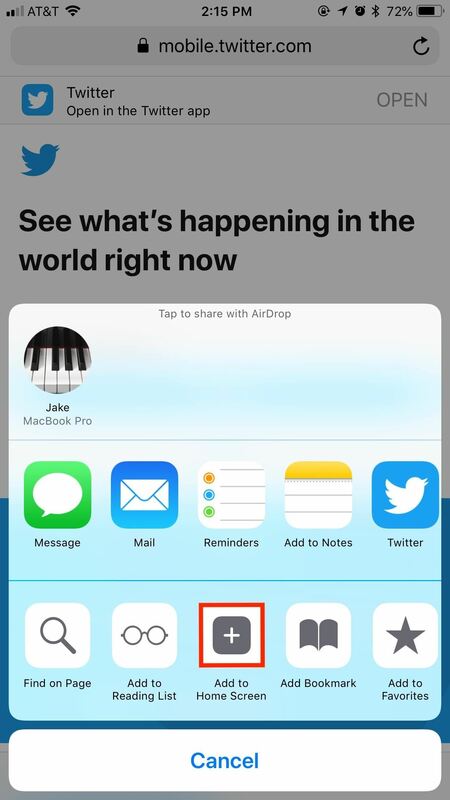 Then, find and tap "Add to Home Screen" on the share sheet. Next, title your PWA. Some will already give the PWA a custom title different from the source site (e.g. 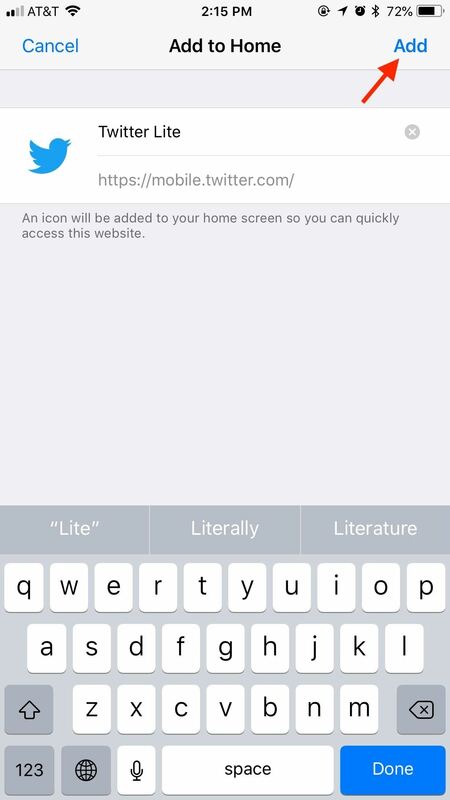 "Twitter" becomes "Twitter Lite"), but you can name your PWA whatever you like. When finished, tap "Add," and your PWA will be added to your home screen. 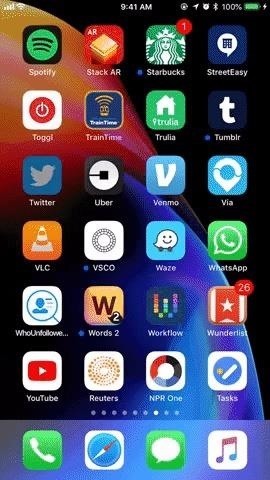 The process for adding a PWA or regular webpage to your home screen. In many cases, the PWAs will be indistinguishable from normal apps, so feel free to throw them in the mix alongside apps you've downloaded from the App Store. Can you tell which are real apps and which are PWAs? An important note: while all websites can be saved as a bookmark to the home screen using this method, that doesn't make each a PWA. If you open your bookmark and it opens as a tab in the main Safari browser instead of its own app, it's not a PWA. 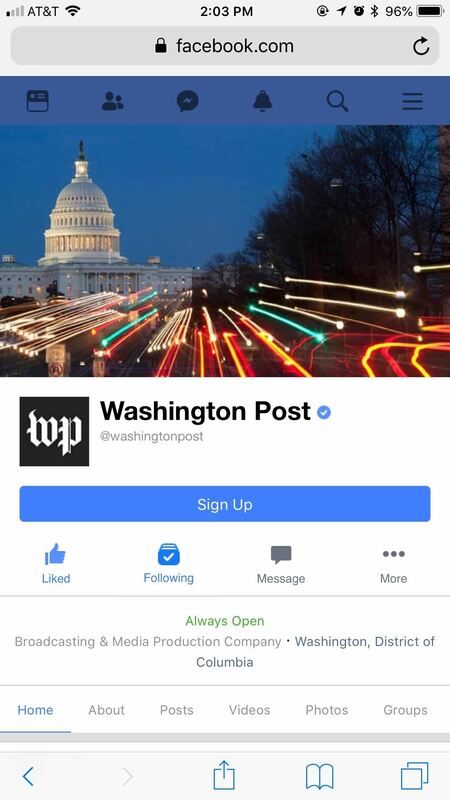 Facebook is not a PWA since it opens Safari (left), but Telegram opens as its own app (right). PWAs present an opportunity for developers to experiment and release apps that users cannot download on the App Store. While still uncharted territory in many ways, there are some fun apps out there that you should try out to see just what PWAs are capable of. Sure, you can download Twitter from the App Store, but you can't download a "lite" version. Lite versions of apps are pretty popular on Android, since they take up less storage space and use less data. Facebook has Facebook Lite and Messenger Lite, for example. So why should we on iOS get it any differently? 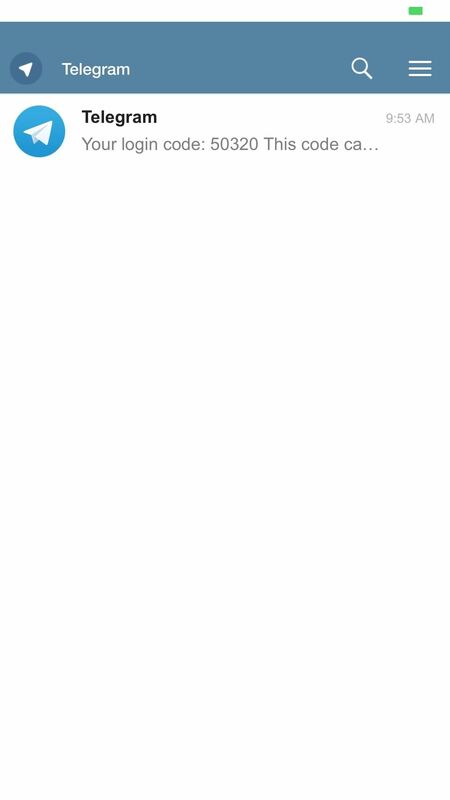 Behold: Twitter Lite. It's a fast, lightweight version of the popular social media service. 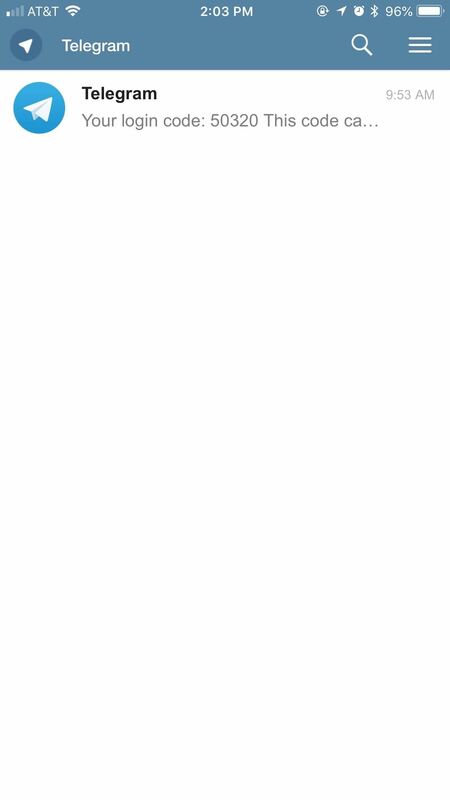 While the official Twitter app only takes up about 190 MB of storage, Twitter Lite takes up roughly 150 by my count. It's not a huge difference, but if your iPhone is low on storage, that 40 MB could come in handy. It also appears to load slightly faster than the official app, however, that time may vary per device. Twitter Lite (left) vs. Twitter (right). Twitter Lite gives you all the features you'd normally find on the Twitter app, in a slightly stripped-down way. You can view Twitter Moments, notifications, DMs, search and tweet GIFs ... everything you'd expect from a barebones Twitter client. The only downsides to using Twitter Lite are related to the nature of PWAs, which means the app does not save its state when you exit it. When you return, it will, unfortunately, reload every time. 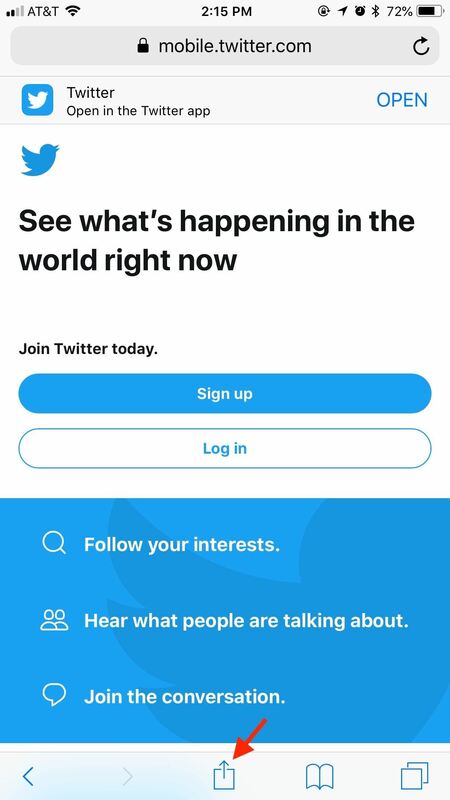 Make sure you remember what you were doing if you need to leave, because Twitter Lite won't. 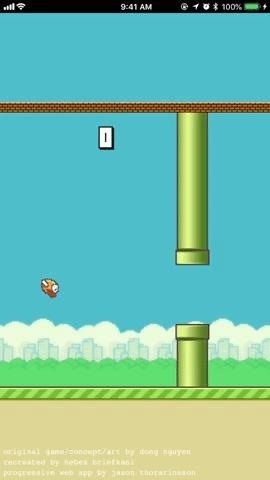 For anyone still mourning the loss of the infamous game Flappy Bird, this PWA is for you. 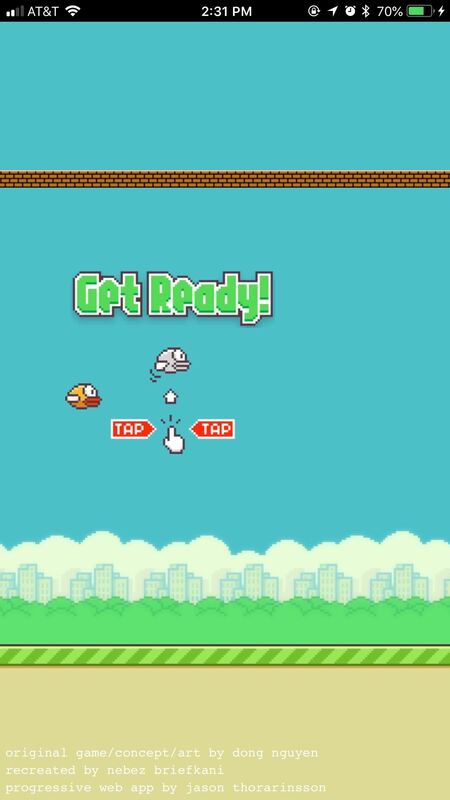 Enter Web Flap, a fully-realized clone of the original flappy sensation. 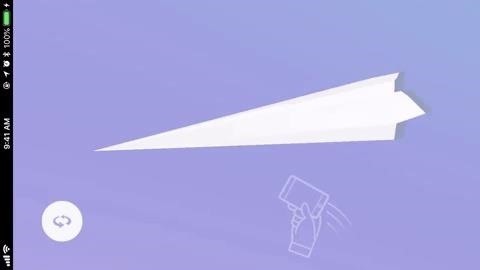 That simplistic yet addicting gameplay is still here — tap to go higher, leave the screen alone to fall. Just as frustrating as ever. While there isn't sound, we expect that could be fixed with greater support from Apple. After all, it's not really Flappy Bird without that killer soundtrack. 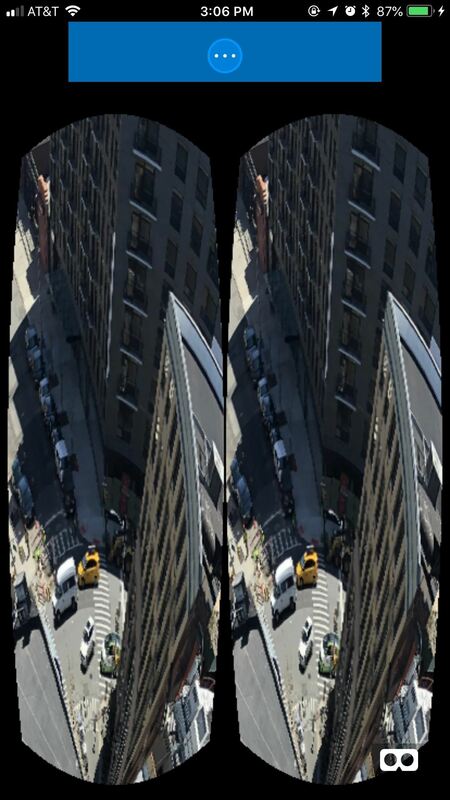 Bubble is a photo viewer, with one intriguing twist — it allows you to view 360-degree photos by moving your iPhone. If you want to see what's behind you in the photo, just turn around. 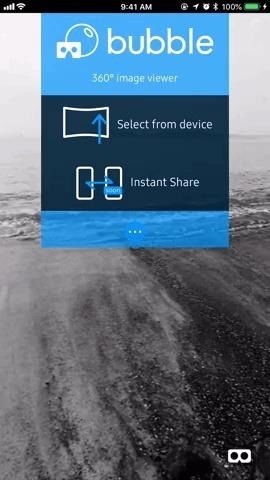 It's a great way to experience any 360-degree photos you've taken. 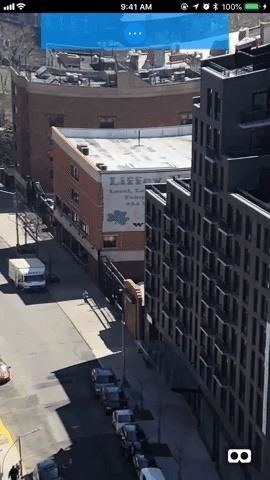 Of course, there's bound to be many of us — myself included — who have never taken a 360-degree photo before. Don't worry — uploading any photo transforms it into something equal parts bizarre and awesome. 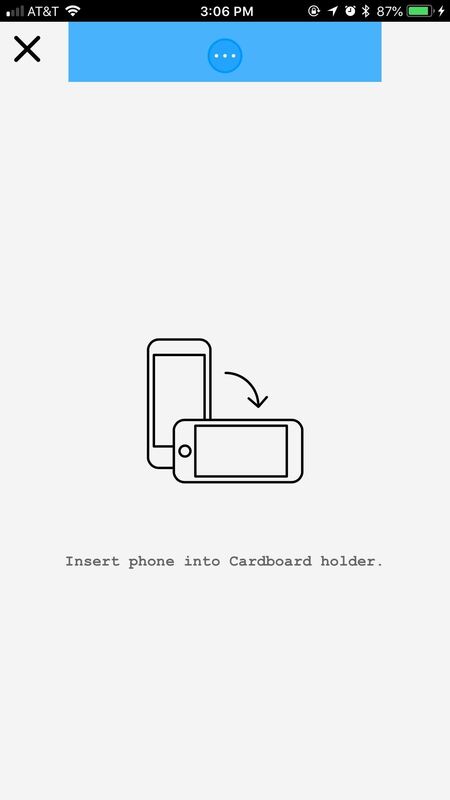 If you have Google Cardboard or a similar headset, you can tap the Cardboard button in the bottom-right corner of the display, and your view will be split in two. You definitely won't want to use this mode without a headset. 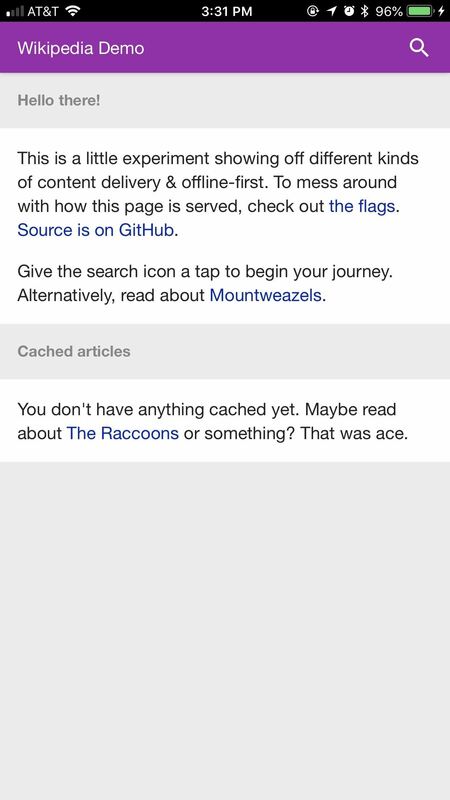 WikiOffline lets you save Wikipedia articles for, you guessed it ... offline reading. It comes in handy if you know you're going to be without data or you don't want to use your data, and you need to do some research, light reading, or anything you might need Wikipedia for. 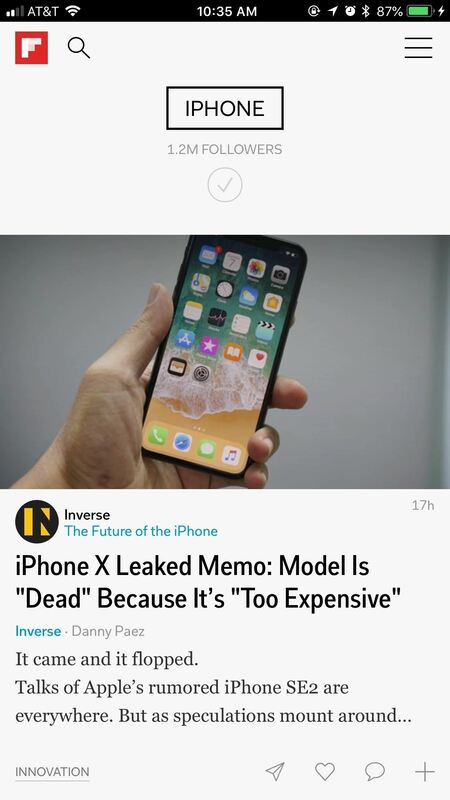 Before exiting an article you want saved, make sure to tap "Read offline" in the top-left corner of the display, as the article will not save without you doing so. You should note, however, that the creators acknowledge that this is just an experiment at this stage, so take that with a grain of salt as you use it. Progressive Beer isn't a fancy, hipster brew — it's a beer guide from ales around the globe. You can use its vast directory to learn more about all the different beers out in the world. 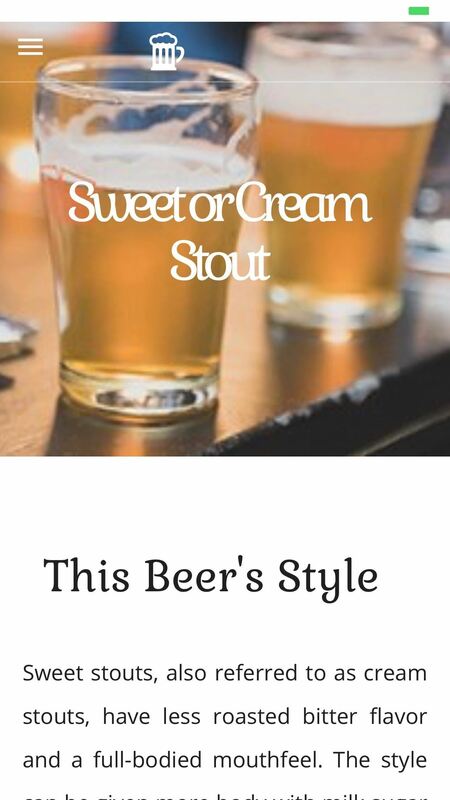 From sweet or cream stouts to India Pale Ales, Progressive Beer can help you read up on any beer you aren't familiar with. 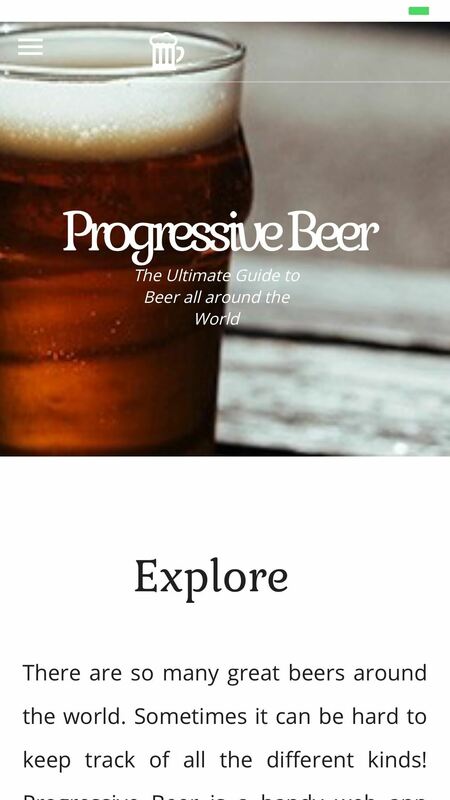 You can scroll through Progressive Beer's seemingly endless list of beers or use the search function to find what you're looking for. You might want to take a scroll through this list, however — even the beer aficionados out there might learn something new here. 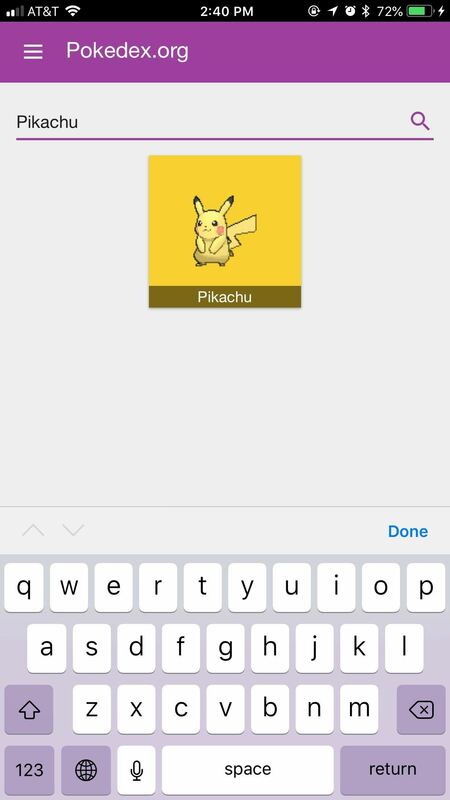 Pokédex will probably be a bit more niche than others, since you, presumably, need to be a Pokémon fan to really enjoy what this PWA has to offer. 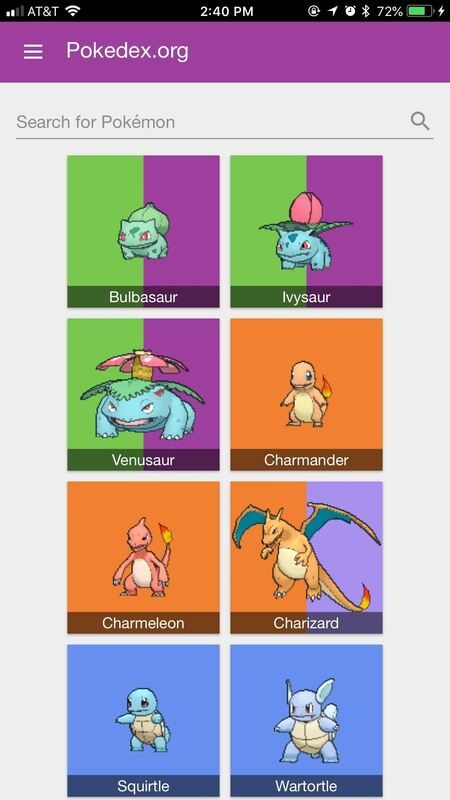 As its name would suggest, Pokédex is an encyclopedia of every current Pokémon through Generation V. It appears the developers haven't quite gotten around to filling the dex for the latest two generations of Pokémon, but if you're playing through any of the older games — up to Black & White — this will serve you just fine. 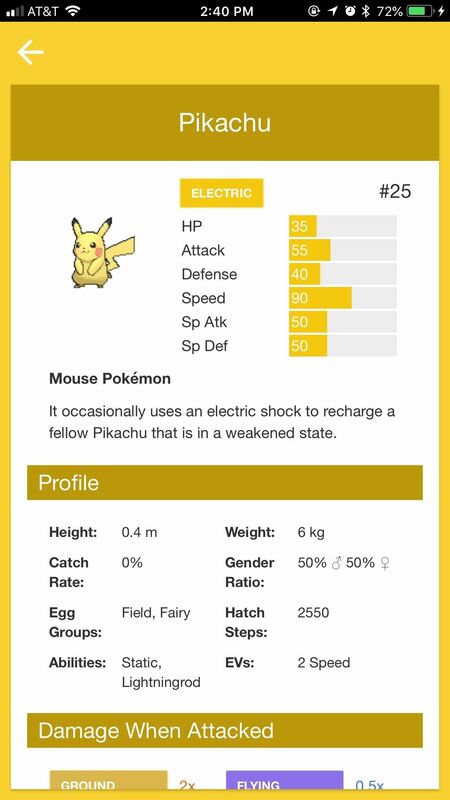 Users can search for a specific Pokémon in question or can scroll through the long list of 649 that Pokédex keeps tabs on. Once you do select a Pokémon, Pokédex will throw a lot of information at you. Luckily, that information is presented in a clean, functional way, with plenty of attention to detail. Admit it — you've been looking for a web-based podcast app. Well, even if you weren't, you might want to give Podle a try. 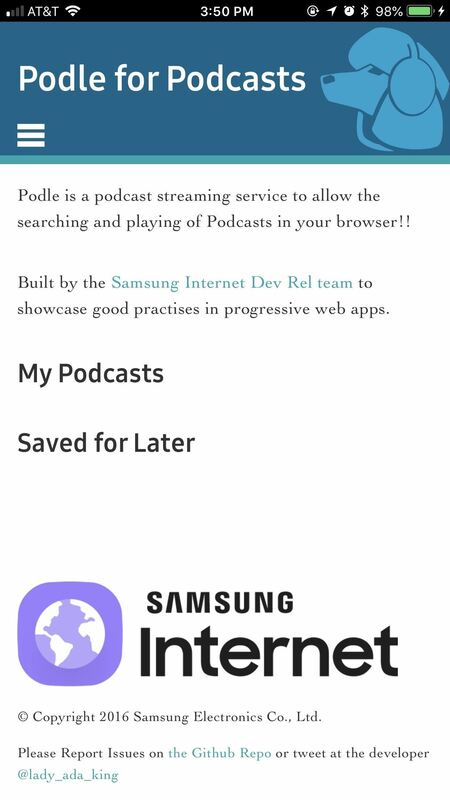 Podle was built for browsers, which makes for an excellent PWA. While originally designed by Samsung Internet team, it works just fine on iOS. 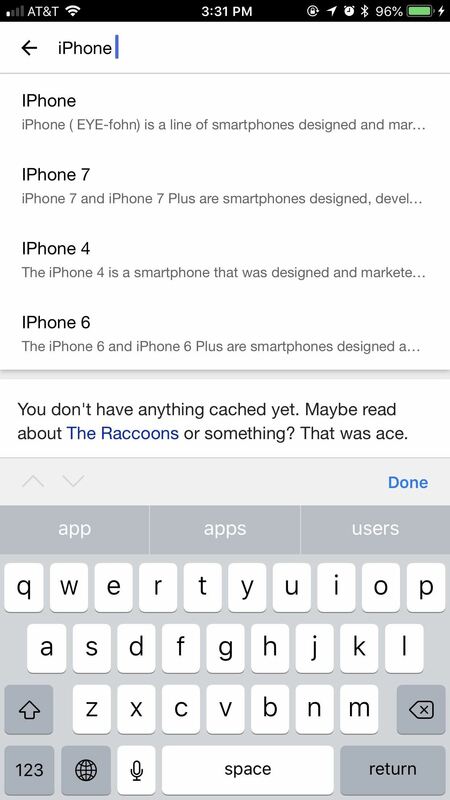 You'll notice its mobile-web qualities when typing queries, as the entire page zooms in on the search field. But once you start playing podcasts, the app just works. 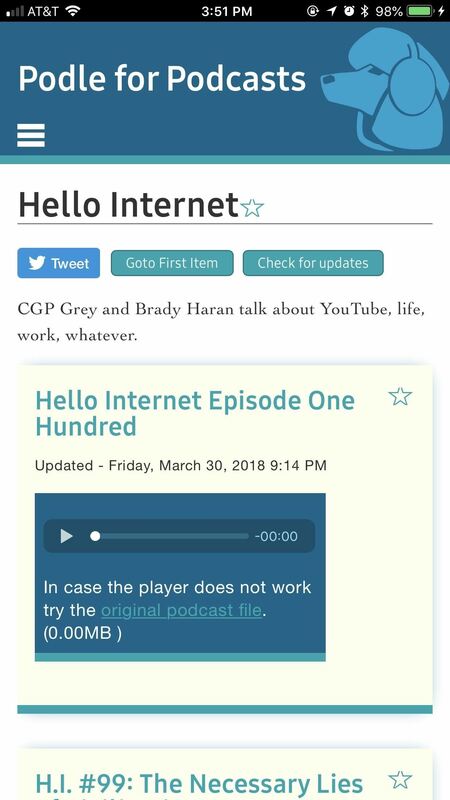 You can save any podcast you want for later listening by tapping the star next to its name. 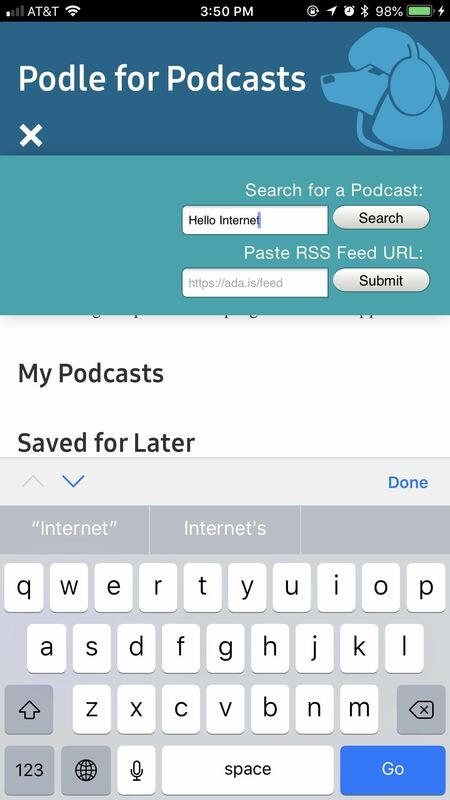 It will appear under "Saved for Later" on the main screen, which you can access at any time by tapping the "Podle for Podcasts" banner at the top of the display. 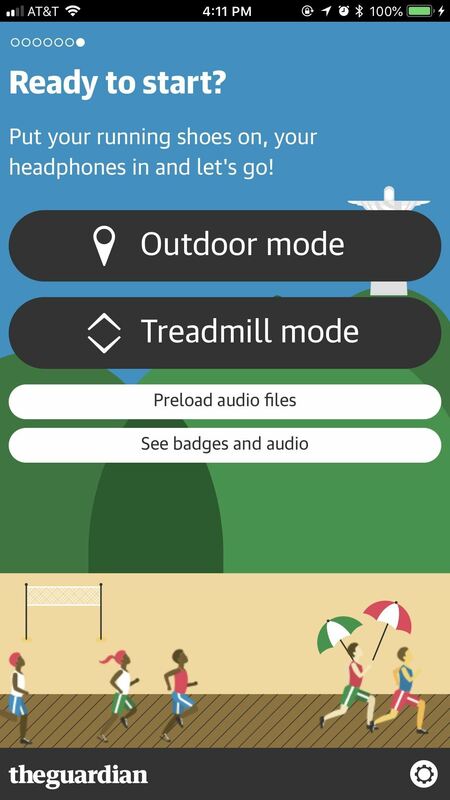 Built by The Guardian, RioRun is a PWA that challenges you to walk or run the length of the Rio marathon (26.2 miles) over three weeks. 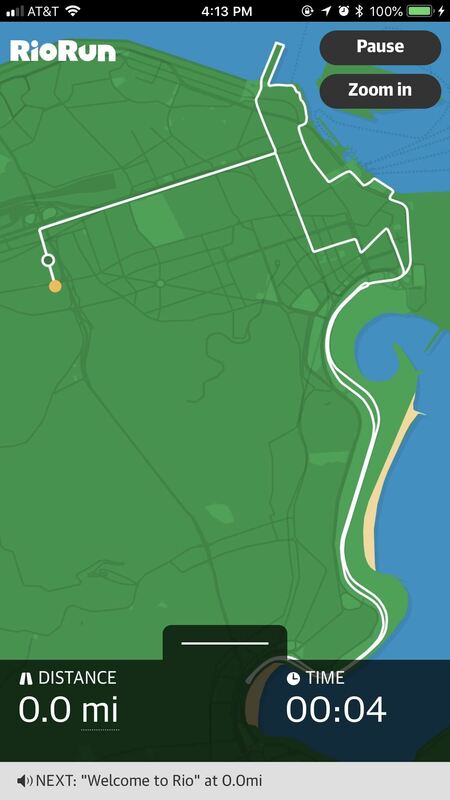 The PWA gives you information about the area of Rio you're "in," based on how much you've traveled, which can be accomplished indoor or outside. If you're worried about using your data, you can preload the audio files RioRun plays as you move. You can also stop at anytime — RioRun saves your place, and lets you complete the marathon in as many sessions as you need. 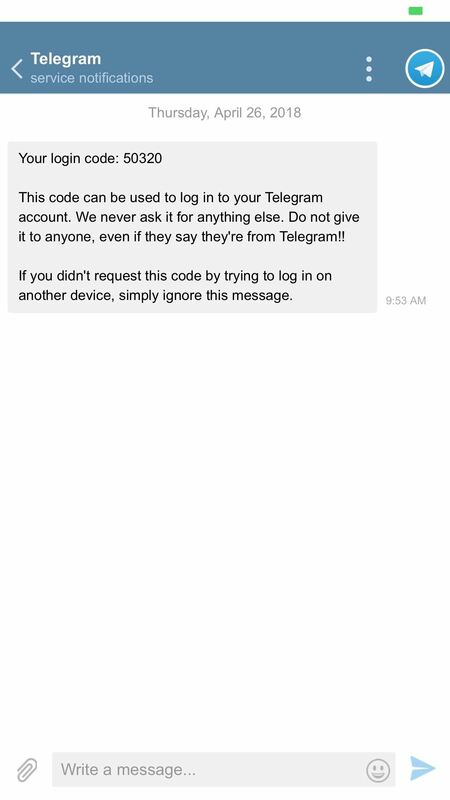 Telegram is a unique messaging service that lets you send end-to-end encrypted messages if you choose to do so. That means you don't have to worry about third-parties snooping on your chats, which has ticked off certain snoopy governments. It may not be a security-focused as Signal, but it's a good one to start out with. Telegram's PWA might not be as slick as its official app, but it gets the job done. Just like Twitter Lite, Telegram offers all the features you'd expect from the main app in a stripped-down, no-funny-business package. Start new chats, keep up with group messages, it's all here. Don't mistake this one for Telegram just because their icons are so similar (well, at least their official ones). 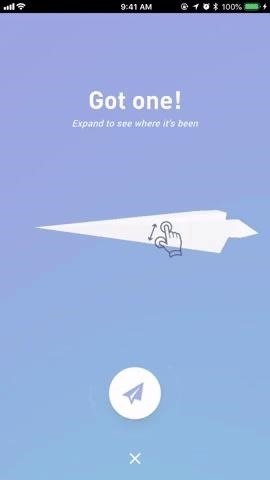 Paper Planes is a fun social experiment that works surprisingly well as a PWA, even when compared to its iOS app. 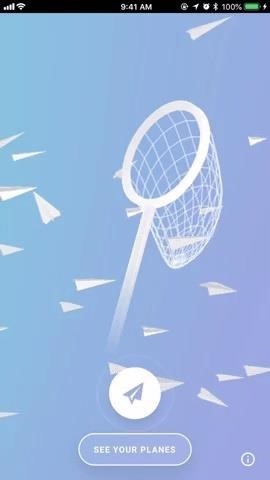 The rules are pretty simple — make, stamp, and throw a paper plane into a sea of over 5 million others from around the world. 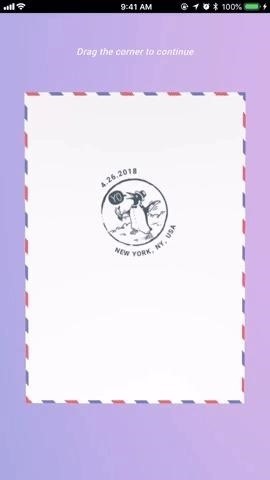 Then, catch one — you'll see the stamps from not just the creator of that plane, but all other people who have caught it as well. Simply stamp it to make your mark, then throw it back to the world for someone else to catch. 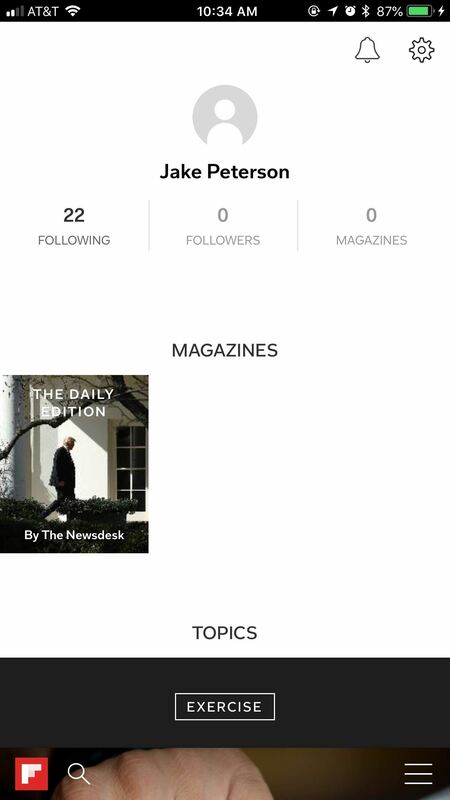 Flipboard is an excellent platform for discovering news and content that's relevant to you. 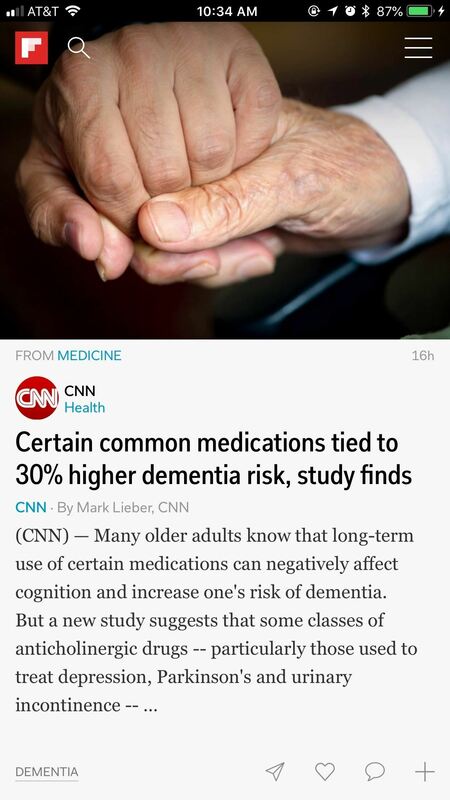 You tell Flipboard what you like, and it gives you a list of articles you're bound to enjoy. Flipboard's PWA works like butter. It performs at the speed you'd expect from a full app. In fact, I had to delete the official app to make sure I was really using the PWA. The only downside here is you can't view articles in the PWA itself. 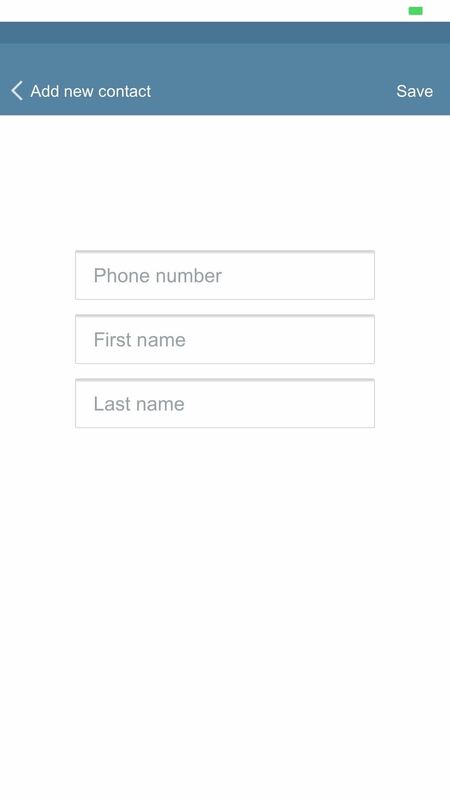 Tapping one launches it in Safari, which can be an inconvenience compared to the main app. However, switching between apps isn't so bad, especially if you know you're supporting PWAs on iOS. There are other PWAs out there that I would love to include on this list, but, unfortunately, they just don't work. Guitar Tuner, for example, would be an excellent PWA to have on my iPhone. However, it cannot recognize my device's microphone, even when I've enabled the microphone in Safari's settings. PWA.rocks has a long list of PWAs that may or may not work, so it's worth going through and trying them out periodically. It seems some of the web apps need to wait until Apple provides further support for them. Until then, we'll have to make do with whatever works.